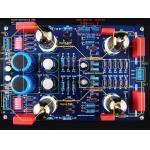 The circuit design is referenced to VTL phono tube preamplifier and the design values are optimized. It support both MM or MC phono input with RIAA compensation. It uses four 12AX7 vacuum tube in serial common-cathode configurations and buffer stage to provide sufficient voltage gain for weak phono input signal. The input impedance can be changed by the DIP switch. The signal paths of this PCB layout is designed in symmetry for both channels. Dedicated power rails, ground, and signal paths, althogether are taken into considerations so that all are to minimize the parasitics, cross interference, and influence of RFI. 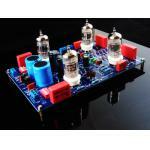 · Four 12AX7 vacuum tubes. · Support both MM and MC. · Input impedance can be varied by DIP switch or modified resistances by advanced users. · Two single-ended inputs and two single-ended outputs. · Four large reservoir decoupling capacitors for power rails. 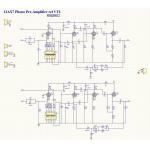 · Power requirements: one 260V(100mA) DC and one 12.6V(2A) DC.